Not content with making an exciting science fiction movie from one of the genre’s most loved works, Steven Spielberg has aimed higher. Unfortunately, War of the Worlds suffers by coming out two weeks after Batman Begins – whereas the latter successfully blends both action and drama with political commentary and allegory, War of the Worlds sadly fails. Were it not for the Dark Knight’s recent turn, I may have enjoyed Spielberg’s heavy-handed approach to sociological reference. His use of badly scripted jokes about European terrorists attacking the USA aside, his far too obvious references to images of the 9/11 attacks betray him. He has used scenes of a modern horror, and copied them to help us feel the horror of his plot, and I resent being manipulated like that. Batman Begins was not at all subtle, but it was far more subtle than this. That aside, there are standard Spielberg ‘big scene’ moments, that are sure to satisfy the uncritical. The long set piece inside the basement with the proboscis-like extravasation from the tripod was entertaining, and the initial scenes are adequately shot. Disappointingly, the revelations of the beginning have been better handled in several recent disaster movies, the much-pilloried Independence Day one of them. 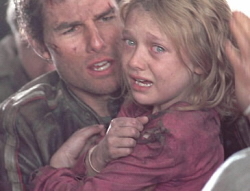 Much of the work between Tim Robbins and Tom Cruise is a failure – the ‘tension’ seems manufactured, and the final outcome is glossed over by Spielberg in a horrible oversight. What could have been an interesting ethical discussion instead turned into a non-issue. Given the amount of screen time spent on this sequence, this is an inexcusable waste. Dakota Fanning, presumably written as a sympathetic character, comes across as simply pathetic… she spends all her time crying or screaming, or betraying her family to the enemy in some other way, and frankly she is just annoying. Justin Chatwin seems barely to have turned up for filming, his screen presence is that flimsy, and Tom gives his stock standard performance. Miranda Otto is wasted, although this seems more likely an effect of Well’s original story being written in the 19th century, rather than a poor choice on the modern day scriptwriters’ behalf. The CGI is impressive, with barely anything catching my eye as glitchy or unbelievable – in fact this is the best aspect of this film. The final ending on the other hand, is woefully misjudged, with a massive buildup to an absolute anti-climax, followed by an extremely poorly scripted final voiceover, that is, at best, trite. It almost seemed, after so long getting there, that they just ran out of steam – both the aliens and the film-makers! Unfortunately, War of the Worlds is very disappointing, and provides only minimal entertainment. The worst of the US Summer blockbusters thus far… it is this year’s The Day After Tomorrow. This entry was posted in Film Reviews and tagged Science Fiction by Mark Lavercombe. Bookmark the permalink. Bah! Mark… You’re too harsh. War of the Worlds was great fun. I was determined not to like this film… I mean as far as gratuitous remakes go, this is almost as bad as Charlie And The Chocolate Factory or Planet of the Apes. But I was pleasantly surprised by this exciting, scary and thrilling popcorn flick. Spielberg certainly knows how to direct the big budget sci-fi extravaganza. The action scenes are masterfully handled, and a couple of shots simply astounding. I don’t want to even think about the rendering time involved in some of the destruction scenes. Dakota Fanning is absolutely brilliant, and in fact outdoes just about everyone else in the movie. Her performance in the freeway scene was incredible. I agree with Mark in that Justin Chatwin is decidedly average – his character isn’t interesting or for the most part consistent at all. 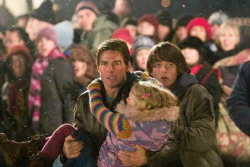 Tom Cruise is Tom Cruise… nothing brilliant, but nothing bad either. Tim Robbins is a major disappointment, especially considering his usually awe-inspiring performances. The film sticks a little closer to the book than the 1953 original did – at least here we actually have tripods. There is one unforgivable diversion right near the end – a pathetic attempt to show that the Yanks aren’t completely powerless. This not only undermines the effectiveness of the original story but makes the characters look like a complete bunch of trigger happy twits. Thankfully, however, Friedman and Koepp didn’t stray into traditional disaster movie formula ie: focussing on a dozen mini stories. In keeping with the Ferriers for the majority of the film we have a much more involving and interesting story than the Independence Day / Deep Impact type films. Speaking of which, I’m glad Spielberg held back for some time after getting the option rights to War of the Worlds, ‘cos in the early to mid nineties, I was well and truly over the whole disaster epic thing. It’s interesting that the opening sequence was basically the teaser we saw way back at the start of the year. Morgan Freeman’s top and tail voiceover is actually almost copied verbatim from the book, as I understand, so Mark’s frustration at the final moments (and indeed the culmination of the narrative) should be aimed towards the book rather than the film. I didn’t see much in the way of political subtext, aside from the aforementioned ‘USA! USA!’ bit towards the end. I thought this quite thankfully stayed away from any deliberate references to current events.